One day, I realized that I, a former Japanese, has reincarnated into a different world as Cristea Ellisfeed, a Duke’s daughter . Reincarnation…? Duke’s daughter…? A world with magic…? Is this a light novel!?!? I received the reality while being confused. However… I’m dissatisfied with this! This full course is somewhat dissatisfying! Sweet-only sweets! I’m sick of it already!! The taste of commoners, please!! I should have taken the description more seriously. The lack of a translated title also threw me off, but from my interpretation of the machine translated, it should be "The Reincarnated Young Lady is hungry for Commoner food". Right, this is basically a "Sugoi Japanese food!!!!" story, where the main-character shows the brilliance of Japanese food to these poor Medieval European-esque people, whose food culture is somehow terribly underdeveloped compared to her superior Japanese cuisine. but also I can understand one of the other reviewer's criticism of "Japanese food banzai!" culture. I know that when I started eating Japanese food, there was a lot that tasted so strange to me, I couldn't tell whether I liked or disliked it. Yet everyone in the story immediately finds everything the MC makes to be so delicious, to the point of fighting over it. And I wish the MC would stop trying to make everyone eat raw eggs. I remember being given oyakodon while in Japan once, and no matter how everyone reassured me it was safe, I was so freaked out, I could barely stand eating the non-raw bits. Also, the fact that no one ever questions how the MC got her knowledge about food unknown to her culture, even when she's touting its health benefits, seems far-fetched. Even the "Japanese"-ish people in this world don't really question it. Still, this is a lighthearted, fun story. Update for 174: to be honest, I'd now put this at 3 stars or 2 and 1/2. In the last 40 chapters I've gotten tired of this story, because of the points mentioned in justpassingt's review. While the story has always been food heavy, my impression is that food has slowly taken over the entire story. It was at least interesting when there was world building, but now it seems like 85% of the story is food, 10% is mofumofu centric, and 5% anything else (with perhaps 1% of the 5% being plot). I feel bad, since apparently 7 people liked my positive review, but I can't just keep quiet now that my old review is outdated. I wouldn't say it bad... But reading the same thing over a dozen of times without any changes is boring. It looks like slice of life but I don't have a feeling of life. All because of too much repeating with no changes. Great story, simple, with some character development, heartwarming and funny. The MC does mess up many times due to common sense problems, however that is also part of the comedy. I don't get why so many haters left bad reviews, the story is well written, don't feel any confusion while reading, both author and translator are good. I honestly really tried to finish this and even like it up until a certain point but... I just can't, I just really can't. Some of the reviews here basically share the same thoughts as I. Such as the reviews by Hundred Lilies, Renaxan, SovietWeeb, etc. It started out decent enough, I liked how light-hearted it is and the fluff but as the story goes on it just ends being so repetitive and tiring to even read... more>> through. It had great potential to be something greater but was not executed well, there are plots that could've been used within the story to make it actually progress as something good but felt like it was cast aside to make a point of "lack of variety of food" = "make more great food!" + "no one will question my knowledge! cause food!" + "ah! cute animals!" and that basically becomes the whole entirety of the story. It could've been great really since I've only read up to 101 since I gave up trying to read through it as it was tiring as hell in all honesty. Little to no character development, food overtakes the whole story, barely any plot progression or if there even was a plot to start with. At this point on the spoilers tab, I might sound like I'm complaining but yeah at that point I probably am but it's just cause... So much wasted potential. It is so rare to find a decent Isekai LN/WN/Manga with a decent or actual great female lead, and this one just ended being so disappointing in the end. Firstly, just because she suddenly remembered her past life doesn't equate to her immediately forgetting the etiquette of nobility. It's like as if those 8-years of her life was cast aside for her old one just to make a point that she was a reincarnation of an old woman. That isn't an excuse, I expected that she would be either using it to her own advantage or struggling between her past life's personality and her current one. Little to no background was really given about her personality during her current life before she remembered, pretty much it was glossed over. Secondly, her powers which can be used as a means to the plot such as complicating matters, crisis, etc. could have been as said used but was cast aside in favour of what I've previously said. This also includes the things about the sacred beasts which are fundamentally and technically could have brought an interesting point into the story such as their powers and stuff but was cast aside for "ah! cuteness! of course cuteness! I'm not even going to question the fact that these guys can technically desiccate a whole country if I or them wanted but ahh! cute!" and no one is even questioning at the fact how she even got these deadly creatures who supposedly lived miles away or some sh*t.
Thirdly, the major thing that annoyed me on this is the fact that no one, I mean literally no one is questioning her. Like how the f**k did this 8-year old suddenly knew how to make this outrageous (I say outrageous because note that she is in a different world that apparently has bland food with no advancement on the food department whatsoever till she came) food nor even question at the fact that her magical prowess exceed above others nor how their daughter's personality suddenly shifted into something else as if they didn't know how she had acted for 8 years prior to her remembering anything. Lastly, Sei's situation could have been a far more interesting plot. It had a large potential and then suddenly gets forgotten along the way. It had potential such as the situation of what if's, drama, etc. you know the drill. The same could be said for the other character's, except for the prince. Motherf**ker is creepy, he's like 13? 14? And is crushing on a 8-9 year old child and is planning to get her just because he fell for a cute face and she can cook good food. Pretty f**king shallow reason. I really enjoyed the beginning of the novel but as it continues she just turns into mary sue the chef. This definitely does not deserve some of the critical views on it. It is a heartwarming, cute and easy read kind of story. The focus, of course, is central to food, the undertones of shoujo are there but at the point I am at, it's minimal. This is understandable as she's still a child. It is with an unbelievable amount of pleasure that I can however, inform you that the romance aspects do get stronger as the story develops. 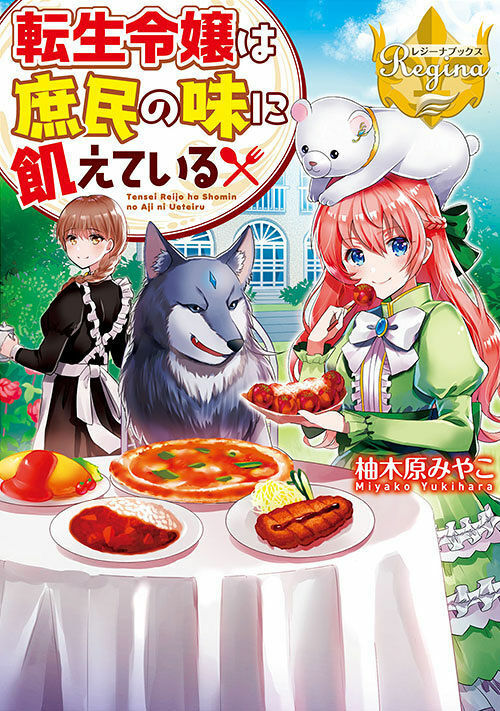 The viewpoint is mainly from the MC, an atypical food obsessed oblivious... more>> reincarnated noble girl whose highest aspirations is to be able to eat well. She freely uses magic and is not too keen on manners. Reading about her is very charming. The other reviewers are harsh in their views about her character in that she is selfish and a glutton, this is false, her family and servants dotes on her and do their best not to indulge her. This becomes more aware during the progression of the chapters, the interaction between her family can be seen as comedic considering how the MC often gets them to see her side of things. The MC is not the most proper of people, but she is relatable in her desire to eat good food, and sweet as she likes it when the people who eat her food like it. In some cases I can say it reads a bit like "Kenkyo, Kenjitsu o Motto ni Ikite Orima" in its daily slice of life sort of style, however, the life part is a fantasy world with magic. I had this open in my tabs for at least a month waiting to read it. Well, I did and I dropped it real fast. Took me less than 6 chapters to realize this story isn't gonna be anything interesting. The story lacks Plot, Characters, and anything to keep me interested. Most of the dialogue is about Food and more food and how this food is worse than this food or why food from Japan is better than food from this world. This story has a weird obsession with food and... more>> it gets grating fast. I never understood Japanese stories and their obsessions with talking about food in so much detail. I was interested in this story primarily cause this was an Isekai novel with a female MC that doesn't have a romance tag. Something rarely is seen. Well since I dropped this on Chapter 25 I can't say for sure later on. But there is one kid that is introduced that if this was a romance novel he'd be the love interest. The boy is probably the most annoying part and the story has him do these of rude things to the MC that is a Noble like him eating the food she made cause she won't tell him something, Blackmailing and even assaulting the MC. I'd love if the MC was a smart character, And, Used the fact that some commoner just tried doing the above-listed things. As he besides being a douche is also preventing her from making Asian food. I don't even see the reason why the MC begged her parents for him to work at the Mansion. She knows how to make Asian food so he's not needed. For those who want to read this for the sake of reading a transmigrated/reincarnated heroine who somehow brings 'new' things/ideas to the new world from her previous one, be warned that the behavior of the MC is just mentally tiring. She was supposed to be a grown woman before dying so I was expecting she'd be more refined than her actual age (current body). But NO. Her reactions and expressions just kill my brain cells everytime I read one so I was basically skipping her narration and just reading the... more>> dialogues. Really too much. I can enumerate a couple of LNs where the MCs know how to properly wield their childishness (yes, I definitely believe this as a weapon for such kind of MCs) but this is not one of them. I am not a hater of fluff. For example, the LN - At the Northern Fort is fluff and is just the right kind of fluff... and within reason. Another example of airheadedness and childishness that I prefer is the LN - I Said Make My Abilities Average!. She actually acts so unrefinedly you'd think that the 8 years of studying as a daughter of a noble never happened before she finally remembers her past life because that's just how much her glutton self took over reason. When she remembered her past life, her current 8-yr-old personality just died? Weren't nobles supposed to learn manners at a young age... so for her, she just forgot those and everyone doesn't even think it's weird that her behavior shifted so much. She is so childish and is such a glutton. All she's thinking of and wanting to do were to locate ingredients to make 'Japanese' food (No, I love everything about Japan, this story just ruins that for a bit). The only purpose that I can think of for this story was to satiate her unceasing hunger. I just read less than ten chapters so forgive me if I'm basically complaining when I have yet to know what happens 300+ chapters from where I stopped, but that's just how I got so annoyed and tired that I have to stop otherwise I'd ruin my day. I'd rather read other LNs than this. This is a very slow story, be warned. I am at chapter 261 but the MC is barely 10 years old and is months away from the School/Academy Arc. There is no plot yet, although I am hoping for a glimpse of it when she finally joins the academy. Im not saying this is bad story, but honestly its likely cooking novel warped in isekai material. And most of them I could felt as filler that even idk where's real plot or fillers. Our MC is duke daughter who seemingly as master chef of japanese cuisine. Then most plot are about cooking, and how people enjoyed her cooking. Other character development are good altho its lacking (since everyone adores MC so they're retard) atleast im remember their name. The plot are damn slow, yet full of cooking. World building somehow... more>> unclear, maybe its otome game world, or isekai.. Theres also not villain appear in 300 chapter. Just the usual light story with reincarnated MC with knowledge and OP magic as the cheat. Until the latest chapter I read (ch248), there doesn't seem to be any hint of plot, and the story itself is kind of repetitive. But the story itself is entertaining, heartwarming, funny and the characters are adorable. If you're looking for an unforgetable and epic story, unfortunately this novel is not for you. But if you only need some dose of sugar to relieve your stress, then I'd recommend this novel.